Neck pain can come on suddenly, or gradually build up over the course of months or years. It can range from mildly uncomfortable to extremely painful. Either way, if you are suffering from neck pain, you will want to find a way to relieve it as quickly as possible. The most common treatments for neck pain are massage, physical therapy, chiropractic, osteopathy and pain medications. However, these medications can cause unpleasant side effects and many people prefer to stick to natural, drug-free therapies. 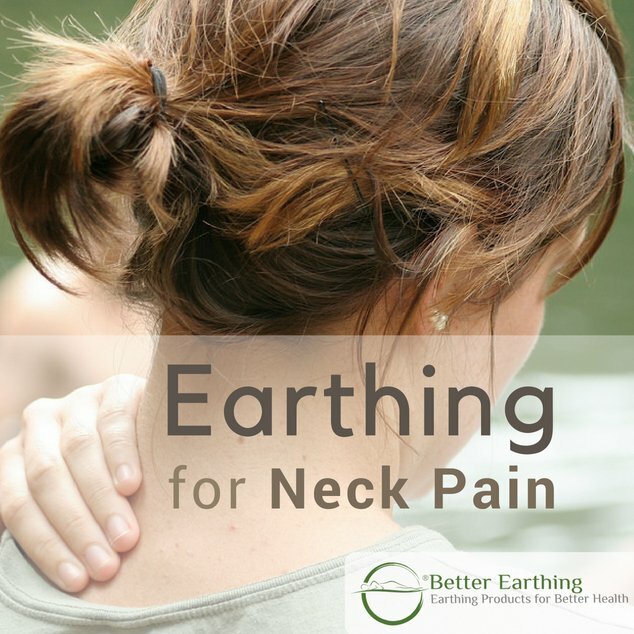 A less well-known option for neck pain relief is earthing. Also known as grounding, this is a way of utilizing the earth’s own electrical charge to bring about a wide range of health benefits. For example, earthing can effectively reduce inflammation and relieve many types of pain, including neck pain. There are many different possible causes of neck pain. One of the most common is trauma. This could be due to a sports injury or whiplash. This type of neck pain will generally come on soon after the injury is sustained. However, it can take up to a few days for neck pain to develop after trauma. Poor posture is another common reason for neck pain. Lack of awareness, working at a poorly set up workstation, carrying uneven loads or sleeping in an awkward position can all result in neck pain. This type of pain should resolve relatively quickly once you have improved your posture. A crick in the neck, also known as wry neck, comes on suddenly and can be extremely painful. It is usually caused by a sudden, awkward movement of the neck or sleeping in an unusual position. Although this type of neck pain is severe, it usually gets better within 24 – 48 hours and does not require further treatment. Denegerative diseases can cause neck pain including osteoarthritis, anklosing spondylitis, cervical spinal stenosis and cervical generative disc disease. These cause changes in the spine, which puts pressure on the surrounding nerves. This causes pain, numbness and weakness of the neck, arms or hands. Other causes of neck pain include muscle tension due to stress, herniated discs, inflammatory diseases such as fibromyalgia or infections such as meningitis. Over the counter medications can be effective for mild to moderate neck pain. However, for severe neck pain, stronger prescription drugs may be required. Common pain medications include anti-inflammatory drugs, painkillers, steroid injections and topical creams and gels. Topical creams and gels may contain NSAIDs or herbal ingredients which heat the affected area and relieve pain. They are generally safe although care should be taken if you have very sensitive skin, allergies or asthma. Many people prefer to avoid taking medication and use natural methods of neck pain relief. These include manual therapies such as physical therapy, chiropractic and osteopathy. The aim with these therapies is to relax the muscles in the surrounding area and correct any structural imbalances. If you go for any of these therapies, you may also be prescribed exercises to improve posture and mobility. Massage is a popular therapy which relaxes the muscles and relieves emotional stress. It releases endorphins, the body’s natural painkillers and improves circulation to speed up healing. Acupuncture is another therapy which relieves both physical and emotional tension. It also affects the nervous system, blocking pain messages from reaching the brain. Like massage, acupuncture releases endorphins and improves circulation. You can also treat your neck pain at home by applying hot or cold compresses. It is generally recommended that you ice a recent injury to reduce inflammation, and use heat for more chronic pain such as arthritis. If you work at a desk, make sure that your workstation is set up properly. You should be looking straight ahead with your lower arms on the desk and feet on the floor. Your elbows and knees should both be at 90-degree angles. Take regular breaks to stretch and move your neck. It is important to keep your neck mobile and neck collars are generally not recommended. Earthing, also called grounding, is another natural solution for neck pain. When you bring your body into conductive contact with the earth, a number of physiological changes begin to happen. Your muscles relax and your nervous system is calmed. See more. The earth’s surface has a subtle negative charge. This is due to high numbers of free electrons formed by lightning strikes and atmospheric pressure. When the earth’s free electrons are transferred to your body, they act as powerful antioxidants, fighting off free-radicals that contribute to disease. Earthing also has the effects of improving sleep, reducing stress and relieving pain. You can experience earthing for yourself by simply going outside, kicking off your shoes and walking barefoot on the ground. You can also bring earthing into your own home with an indoor earthing system. An indoor earthing system consists of a mat, pad, sheet or pillowcase which has been interwoven with highly conductive fibres. This is connected to the earth either by a wire, run to an earthing rod placed outside, or via the earth port of your power outlet. This offers a convenient way to enjoy earthing while you work, relax or sleep, whatever the weather. Inflammation is a natural reaction by the body in response to injury or infection. The immune system detects invading pathogens such as bacteria or viruses, or when the skin is cut. This then triggers a complex chemical cascade, creating a barrier around the affected area and summoning white blood cells to destroy the threat. All of this activity results in what we know as inflammation. The typical signs are redness, swelling, tenderness, heat and pain. Whether your neck pain is due to an injury or a degenerative disease such as osteoarthritis, it likely that inflammation is playing a large part. Clinical research on earthing has shown that it can reduce inflammation and relieve pain. One 2010 study looked at the effects of earthing on delayed onset muscle soreness (DOMS). DOMS is a common condition which occurs following excessive exercise. For this study, the subjects were exposed to exercise which caused DOMS in the gastrocnemius (calf muscles). Half of the subjects were then grounded using electrode pads, while the other half were sham grounded as a control. The subjects had their blood chemistry tested before and after grounding to check for inflammatory markers such as white blood cells and certain enzymes and hormones. It found that the subjects in the grounded group had reduced levels of these inflammatory markers compared with the control group. They also reported less pain and a shorter recovery time. This indicates that earthing can effectively reduce inflammation, relieve pain and speed up the healing process. Dr. William Amalu is a leading clinical thermologist and president of the International Academy of Clinical Thermography. His series of case studies on earthing for inflammation and pain showed consistent reduction in symptoms in all of its subjects. One 54-year-old male had been suffering from back and neck pain for one year. He was diagnosed with muscle strain and inflammation due to manual work. After sleeping grounded to earth for four nights, he reported a 30% decrease in pain. After four weeks, his pain was reduced by 70% and after eight weeks it was almost completely resolved. Thermographic imaging showed a significant reduction in inflammation, supporting these results. The image on the left has arrows showing the areas that the subject reported as painful. The image on the right shows the man’s back after 4-nights of sleeping while earthing and you can see cooler colours and thermal symmetry indicating a resolution in inflammation. How Much Earthing Do I Need? Everybody is different, but most people will feel the benefits of earthing after just a few seconds as the muscles begin to relax and the nervous system is calmed. Earthing for 30–120 minutes daily offers reduced emotional stress, reduced inflammation and pain, improved circulation, and a more positive mood. Earthing overnight offers all of the above benefits plus better sleep, more energy during the day and faster recovery from muscular exertion. You can get started with earthing simply by going outdoors, taking off your shoes and walking on grass, sand or unpainted concrete. When this is not possible, you can experience all the benefits of earthing at home or in the office using an indoor earthing system. This allows you to enjoy earthing while you rest, work or sleep, offering a safe and natural solution to inflammation and neck pain. Amalu W, Clinical Earthing Application in 20 Case Studies, unpublished research.